In 2015 20 founding members from the private sector, politics and academia united in a shared vision to turn Zurich and Switzerland into a leading digital innovation hub of Europe. They decided to commit to five initial main initiatives to prove their commitment to action (Kickstart Accelerator, Investor Summit, CeBIT, WorldWebForum, Education Digital). I received the mandate to build up the office of the DigitalZurich2025 association and to take over the coordination of the five main projects as well as any other partnerships necessary to maximize our overall impact. The good news is, we will have successfully made these five projects happen by the time September comes around, i.e exactly one year after our foundation. While I am proud of our accomplishments, and confident to have built a strong foundation for DigitalZurich2025, I am also very aware that there’s still A LOT left to do. So what more needs to be done to turn the digital transformation into one of the greatest opportunities our country has ever had and become a leading digital innovation hub of Europe? Having worked for four years in Zurich’s startup ecosystem and having engaged through DigitalZurich2025 with founders, corporate leaders, politicians, professors and investors, here’s what I propose. Engage mainstream media in a massive ongoing story-telling effort and national dialog around innovation, digitization and pioneering Swiss startups. Do this by establishing permanent TV, newspaper and other media formats dedicated to innovation, startups and digital transformation topics. Also do this by building up at least one big internationally-recognized event (e.g. WorldWebForum). And finally, do this by supporting the grass-roots startup ecosystem leaders who work every day tirelessly towards making this digital innovation hub a reality through their programs, initiatives, meet-ups and more. a) leaders from all sectors of the economy as well as the general Swiss public (kids to professionals to retirees) to educate themselves in all things digital. Work with our Education Digital partners to build up a physical education center and massive online platform which succeeds in educating 250’000 people (5% of the Swiss labor force) annually via 1-day to 3-months courses in coding, app development, social media marketing, VR, game design etc. In this way, we’ll have educated 95% of the workforce by 2025. (Side note: A good example for such a model is the wildly successful US-based General Assembly). b) corporates, academia and startups from around the world to collaborate in the largest multi-corporate accelerator program of Europe (Kickstart Accelerator). Make sure corporates and startups learn how to make the most of this collaboration. Then, take all of it (the mainstream media story-telling, the events, the startup community, the digitally-educated people, everyone involved in the accelerator program) and make them early ambassadors of a bigger “culture shift” towards a strong “innovation culture & startup mentality” throughout Switzerland. Manifest this culture in a permanent large-scale multi-corporate innovation center (ewz Selnau, Innovationspark) where startups, corporates and academia innovate together day in, day out, especially in those areas where Switzerland’s economy is particularly strong (i.e. finance, life science, precision technology, food, ICT). Then, build upon all these initiatives and their momentum and motivate corporates, pension funds and family offices to understand the tremendous investment opportunity around Swiss startups. End the ever-delayed conversation around initiatives like Motion Graber, the Swiss fund etc, and motivate them to create a big several-hundred-million Swiss franc fund which is used to invest in startups that have the business model and burning ambition to scale up, thereby enabling them to become the next Google, Facebook and Apple, made in Switzerland. At last, use all of these successful achievements to persuade politicians across the spectrum that Switzerland’s future depends critically on innovation, digitization and startups. Make them understand once and for all that scaling Swiss innovation globally will be the most important driver of future economic growth and therefore it must be a good politician’s primary concern while in office to a) get out of the way of innovation, and b) only vote for pro-innovation, pro-startup political conditions. 1) Engage mainstream media in a nationwide storytelling effort on digitization. 2) Create a learning center where you can educate 5% of labor force annually in all things digital. 3) Bring together corporates and startups to collaborate in multi-corporate accelerator program. 4) Inspire culture shift and create large-scale innovation space for corporates, academia and startups to work together more permanently. 5) Motivate corporates, pension funds and family offices to create a major fund to invest in Swiss-made scale-ups and fund the next Swiss Google, Facebook etc. 6) Enable pro-innovation, pro-digitization political conditions unparalleled in this world to secure economic prosperity. Am 1.3.16 hat der Kanton Zürich angekündigt, dass er attraktivere steuerliche Rahmenbedingungen für Startups erlässt und seine Praxis bei der Bewertung von Startups anpasst. Hier die offizielle Mitteilung. In den vergangenen Tagen wurde das Thema auf verschiedenen digitalen Kanälen mit grossem Engagement diskutiert. Informative Beiträge dazu verfasst haben unter anderem Stefan Steiner, Roland Zeller in seiner zweiteiligen Serie (Teil 1 und Teil 2) und Stefan Kyora. Auch in den Medien stiess das Thema auf grosses Interesse: Die NZZ nahm das Thema gleich auf die Frontseite und bat mich um eine kurze Einschätzung. Auch der Blick hat zweimal in der Printausgabe darüber berichtet und zwei Standpunkte zur Ankündigung des Kantons aufgezeigt. Die Redaktion hatte in einer ersten Stellungnahme Stefan Steiner vom Institut für Jungunternehmer zu Wort kommen lassen in der gedruckten Ausgabe des Blick vom 2.3.16. In einem Folgebeitrag kamen ich und Christian Wenger von Wenger & Vieli, Vorstandspräsident von DigitalZurich2025 zu Wort. 1. Dass der Kanton Zürich die Steuerthematik für Startups anpackt ist ein Fortschritt für den Standort. 2. Die Ankündigung des Kantons vom 1.3.16 ist ein Zwischenschritt: Es liegt noch politische Arbeit vor uns, um das Startup-Ökosystem in Zürich und der Schweiz weiter zu stärken und Gründern die wirtschaftlichen Rahmenbedingungen zu geben, damit sie auch in Zukunft Innovationen vorantreiben und wichtige Arbeitsplätze für die Zukunft kreieren. Mein Fazit: Es tut sich einiges im lokalen Startup-Ökosystem und darauf müssen wir gemeinsam aufbauen! Seit September 2015 ziehen dank DigitalZurich2025 Grossunternehmen, politische Akteure und Gründer an einem Strang. Das gab es bisher so noch nie in der Grössenordnung. Und schon nach ein paar Monaten, zeichnen sich erste Zwischenerfolge ab. Natürlich ist das ist erst der Anfang: das Potenzial vor uns ist noch gross, die To-Do Liste auch. Das einzige was noch grösser ist - so scheint es mir manchmal zumindest - ist die kollektive Ungeduld, dass alles perfekt sein sollte, am liebsten schon vorgestern, in guter Schweizer Manier. Und hier liegt die Krux der Sache: Veränderung ist fast nie von Beginn an perfekt und Erfolg ist fast nie linear. Somit gilt es weiterhin gemeinsam an einem Strang zu ziehen; nur so haben wir eine Chance, Zürich und die Schweiz zu einem führenden digitalen Innovationshub von Europa zu machen, mit allem was dazugehört, inkl. den richtigen politischen Rahmenbedingungen. What do Airbnb, Dropbox, Reddit, Heroku, and Stripe all have in common? They all started at the world's best startup accelerator, Y Combinator. Founded by Paul Graham, Y Combinator's portfolio of companies now exceeds $30 billion. Due to its all-star roster of companies and exceptional network of mentors and investors, thousands of entrepreneurs apply every year for one of the approximately 80 spots in the program. In part because of the success of Y Combinator and other top accelerators like TechStars, there has been a growth explosion in the space, with more than 2,100 accelerators across the globe. Major corporations and even sports franchises are getting into the game, with Nike, Sephora, Target, Google, and the Los Angeles Dodgers starting their own accelerators. Entering an accelerator makes a lot of sense for startup founders. A recent study by VentureBeat found that companies graduating from top accelerators before December 2009 returned 11.3x on capital invested. Other studies show that the survival rate of companies that go through accelerators could be three times that of companies that don't. What's more, research shows companies that completed an accelerator grew faster than companies that didn't. Entrepreneurship is hard. In 2013 I started my own company straight out of college, Inspire 925. I bootstrapped it, and though successful today, being an entrepreneur means overcoming a lot of challenges. Putting an idea into this world and turning it into a business requires hard work, long hours and a huge fire in your belly. There are days where you move at light speed, sign a big client and feel on top of the world. Then there are (many, many more) days where you experience what Ben Horowitz poignantly called "The Hard Thing about Hard Things." The days where you think it's not quite, not yet or not at all doable. With startup accelerators available for nearly every kind of startup though, it's no longer necessary to brave entrepreneurship on your own. What's more, they also help do away with some of the "Hard Things about Hard Things", enabling startups to grow faster. This is confirmed by John Axelrod, the managing director of Entrepreneurs Roundtable Accelerator, who says of the benefits of accelerators, "We have founders tell us they're able to get done in four months what it would take them a year to get done by themselves." Y Combinator Partner Gary Tan similarly states, "We think of YC as Rome or Athens in antiquity. Come out to Mountain View for three months, you don't have to move here permanently. Absorb whatever really works out here and take that back." While Mountain View, California may be the Rome of antiquity, Zurich, Switzerland may as well be thought of as the Athens. It's got an incredibly high living quality, is ranked among the top 10 Global Startup Ecosystems, leads the world in innovation and is world-renown in finance and precision engineering. The most exciting thing about the heart of Europe? 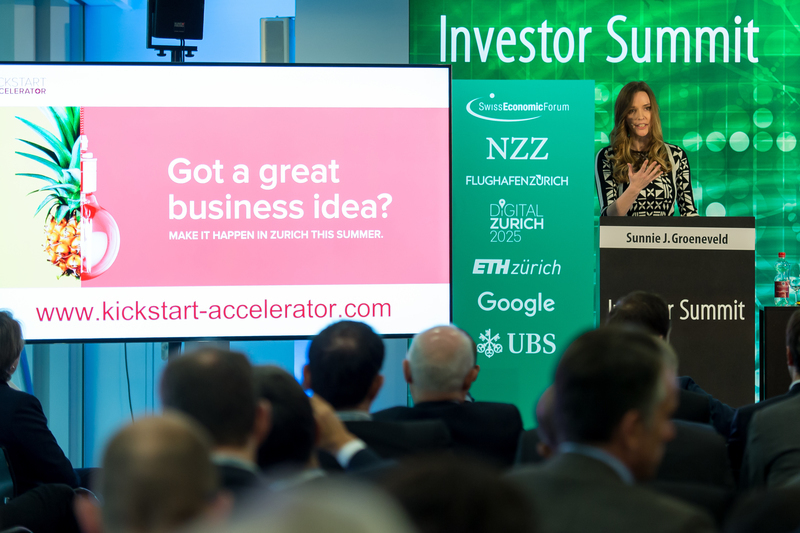 Backed by the Kick Foundation in cooperation with DigitalZurich2025 (which I run the as its managing director), Kickstart - The Swiss Accelerator launched earlier this year. It's the country's most ambitious and large-scale accelerator program to date. Focused on FinTech, IoT, Food and Future Tech, Kickstart provides over $25'000 in seed funding, free office space, mentoring and doesn't take equity. The first class of early-stage startups for the three-month program will begin this summer. Applications are currently open and close on March 31, 2016. More than ever before, the key to wealth lies within the successful execution of ideas. And that's the gap that accelerators bridge. The gap between the 1% inspiration and 99% perspiration that it takes to go from idea to business. This post has also featured on The Huffington Post Tech section. Only hours before the opening dinner of the World Economic Forum on January 19th, I had the tremendous pleasure to moderate the inaugural Investor Summit, DigitalZurich2025's first main initiative. The Summit aims to provide a platform for a select set of our country's most promising and scalable start-ups to connect with international investors as well as CEOs and chairmen from large corporates, as they pass by the airport en route to the WEF. Why is today so important? And what might be the take-aways, as you continue your journey to Davos? We have heard 7 successful entrepreneurs pitch today. Klaus Schwab talks about "drivers that constitute a source of constant surprise." Well, you’ve just met these drivers. It the entrepreneurs among us, that "accelerate innovation." It is these entrepreneurs who are pushing forward the "velocity of disruption." It is also these entrepreneurs who create the economic wealth that results from this fourth Industrial revolution. Entrepreneurs, are after all, the single most powerful job creation engine we know. And just think of all the previous industrial revolutions: every single time, the economy eventually soared, more jobs, more innovation, more life quality. And all, because entrepreneurs found ways to turn innovation into business. So you might well say, it is because of these entrepreneurs that we even have a term "the fourth industrial revolution.” Without them, it simply won’t happen. It goes by the name of Kickstart - The Swiss Accelerator. Kickstart will be a three month acceleration program for early-stage entrepreneurs from around the world. It is a project of the Kick Foundation in cooperation with DigitalZurich2025. Financially possible thanks to DigitalZurich2025, Engagement Migros, EY, Gebert Rüf Foundation, Swisscom and VZug. Kickstart does not take any equity from the startups. It will run from from July through September of 2016 for the first time. The selected founders and their teams will live and work in Zurich. We will give the startups seed funding, mentoring, office space and fast-track access to relevant industry partners. The program culminates on Demo Day, where each startup presents their company to venture capitalists, corporate leaders, and journalists. Kickstart will be the big arrival into the Swiss innovation ecosystem. And Switzerland is bursting with incredible resources for young startups. We will focus Kickstart on those areas where Switzerland is particularly resourceful. Where we have competitive advantage over the rest of the world. What do I mean? Kickstart will have four verticals: The first will be FinTech, wich a focus on wealth management, digital identity and blockchain. If you want to innovate wealth management, you will find the best industry expertise here. If you want to innovate robotics, there’s few places like the Autonomous Systems Lab of ETH Zurich under Prof. Roland Siegwart. If you want to innovate in Food, Switzerland has food experts like few other places. Just think of Migros, Bühler, Nestle - all of them are headquartered here. And then, the fourth and my personally favorite vertical: Future & Emerging Tech. For all those who are crazy enough to believe they have “the next big idea” in whatever industry it may be. We have a place for you. Because the beautiful thing about building an arrival hall into the Swiss innovation ecosystem is that some industries might not exist today. And we know a little something about that too: After all, the birth of the web happened in Switzerland, at CERN in 1989. So without further ado, we are launching the applications to Kickstart today. From now onwards, you can go to www.kickstart-accelerator.com and submit your business idea and MVP, and have a chance to get fast track access to Switzerland - the most innovative country in the world. Share it. Write about it. Spread the word everywhere. Tell the world that Switzerland believes in entrepreneurs as an answer to the fourth industrial revolution. We’ll give them up to CHF 25’000. Mentoring. Free Office Space. We won’t take equity. All we ask in return, is that the entrepreneurs make the most of it. Drive forward, and do what you always do: create opportunities, jobs, economic prosperity, partnerships, innovation. One day we will look back, and think of this as a historic moment. The moment when we opened the gate to ideas from around the world to come to Switzerland, kickstart their business in Zurich and accelerate the forth industrial revolution from the heart of Europe. Update 26.1.2016: I repackaged some of the thoughts from my closing remarks into an op-ed that got published on US Huffington Post Business. You can read it here. It's now almost 150 days ago that something truly remarkable happened in Zurich, Switzerland. In early July 2015, Marc Walder, CEO of Ringier, Switzerland's largest media corporation, succeeded in unifying 20 of the most powerful corporations, academic institutions and political leaders of Switzerland for one shared vision: to turn the Greater Zurich Area into a leading European digital-innovation hub. The initiative organizes five projects launching in 2016, focusing on three key areas: attracting outstanding digital talent, helping existing companies master digital challenges and significantly strengthening the Swiss startup ecosystem. My role in all of it? Make it happen, or more officially: managing director of DigitalZurich2025. First, as Ruedi Noser, member of the Swiss Council of States and founding member of DigitalZurich2025, noted in his op-ed in Switzerland's premier business newspaper Handelszeitung last July, Zurich has all the ingredients it takes: highly educated, technical talent thanks to the Federal Institute of Technology (ETH, ranked number 9 in the world), ample financial capital to invest in digital opportunities and great access to international markets. And the best part? In Zurich, it's all within 30 minutes reach of each other. Second, when Switzerland does something, we do it well, very well. There's a reason why Made in Switzerland is a global trademark for the highest quality known to mankind. According to the Global Innovation Index and the Global Competitiveness Report we rank number 1 in both innovation and global competitiveness. That's a great foundation and starting point. Now add the perspective that 20 of the country's most powerful leaders from politics and business have united to turn Zurich and Switzerland into a leading digital innovation hub. You don't get a better chance at success. This is it. Now we just gotta run ahead and build that bright future. Third, and perhaps most importantly, even though it's time to run ahead, we ought to keep in mind that it's a marathon not a sprint. Silicon Valley took nearly 70 years to become what it is today. Most cities in Europe are currently between kilometer 10 and 15, and Switzerland is about to complete its first few kilometers. But as all long-distance runners know, starting in a pole position and speeding ahead for the first few kilometers doesn't mean you'll finish first. Having completed a full marathon just this summer myself, I can assure you that a lot can happen in between those 42 kilometers. DigitalZurich2025 is proof that business, politics and academia can move ahead together in Switzerland. The extent of our success, however, will depend on two factors: On the inside, it will depend on our ability to make steps fast and repeatedly in the same direction, fully aligned side by side. Externally, success will depend on the number of people from Switzerland and abroad who will join us in making this country a hotspot for digital innovation today and any day in the future.